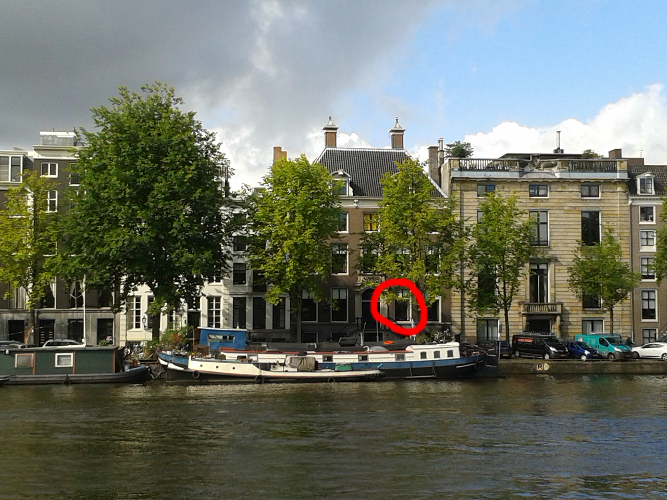 When you find yourself strolling along the Amstel river in Amsterdam, make sure to peek through the windows of the rather unremarkable building at Amstel 218: They have an original Rembrandt painting in their living-room. It is the Portrait of Jan Six, one the most remarkable paintings of the 17th century. What is even more remarkable is, that both painting and building still belong to the Six family, who even live in this house. Maybe Jan Six X just passed you on his folding bike. Jan Six I was a lawyer and came from a wealthy merchant family. He had always been a great admirer of art. 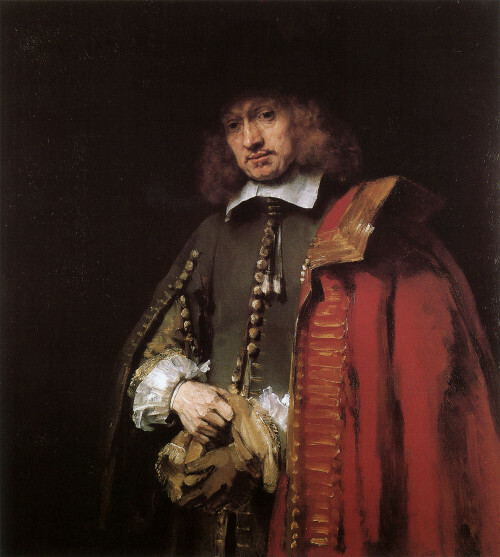 Apparently he was a friend of Rembrandt's, and often helped him with money issues. But the portrait is said to be a gift by Rembrandt, not a commissioned work. Maybe that's why it is so unusual for the time. In general, people wanted to be depicted in a more conservative way then, with a large variety of symbols highlighting their status. But the pose of Jan Six is informal and relaxed, he casually takes off his gloves after a strenuous horse ride. The hands and gloves are crafted by just a few brush strokes, the paint being remarkably thick there. The buttons on Six's coat are indeed Rembrandt's thumb prints. But in contrast to the sparsity in the lower half, the face and hair show incredible detail, and all attention is directed to the gentle eyes, surrounded by a sea of absolute blackness. The style of the painting shows elements common in Impressionism, 200 years before it became fashionable. People say the painting would have totally changed the course of art history, if it had hung in a public space and not in a private home. But the Portrait of Jan Six is just the tip of the iceberg, the House of Six holds an art collection of unprecedented wealth. 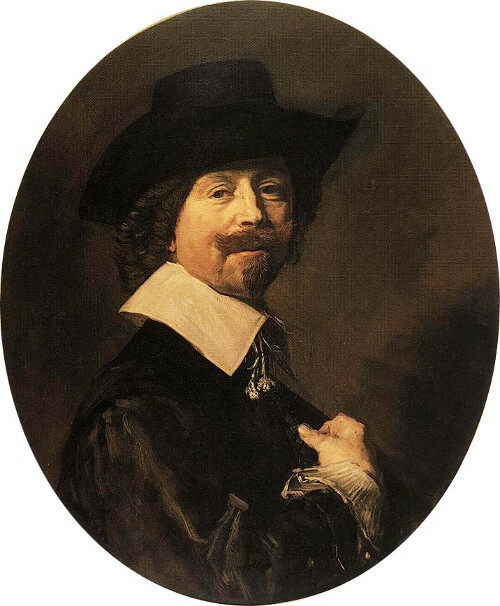 They have paintings by Frans Hals (see below), Pieter Bruegel the Elder, Aelbert Cuyp, Salomon van Ruysdael, Pieter Jansz Saenredam, and many others. Not to mention the sculptures, the silverware or furniture of the Dutch Golden Age. The good news is, you are not limited to peeking through the windows, you can also visit the collection: You need to fill out an online form with your personal data and three visit dates, and then hope you will be accepted. They say that about 5000 people get to see the Six Collection each year, which seems plausible as there are two guided tours each week day, with about 10 visitors. There is no admission fee, the tour is free. It seems like the Six family is getting a huge tax exemption if they can prove the house is a museum, and not a private home. Although the whole process seems a bit odd at first, a visit to the Six collection is more rewarding than a normal art exhibition: Usually you have separate rooms for paintings, furniture or sculptures. Here, it all comes together, the history of the exhibits is so closely interwoven with the history of the family, the building and the city. You'll see a picture of a woman playing a harp, with the actual harp next to it. You'll watch a 17th century painting of the Amstel on your right, and see the actual river on the left. You'll learn that Jan Six's wife was the daughter of the surgeon Nicolaes Tulp, who happens to be the surgeon in the famous Rembrandt painting "The Anatomy Lesson". It is a totally holistic experience, the closest you will ever come to experiencing time travel - this is how a museum should be.